Cleaning and greening your home can feel overwhelming, but Green Enough: Eat Better, Live Cleaner, Be Happier—All Without Driving Your Family Crazy by eco-wellness expert Leah Segedie breaks it down into an easy-to-follow formula. 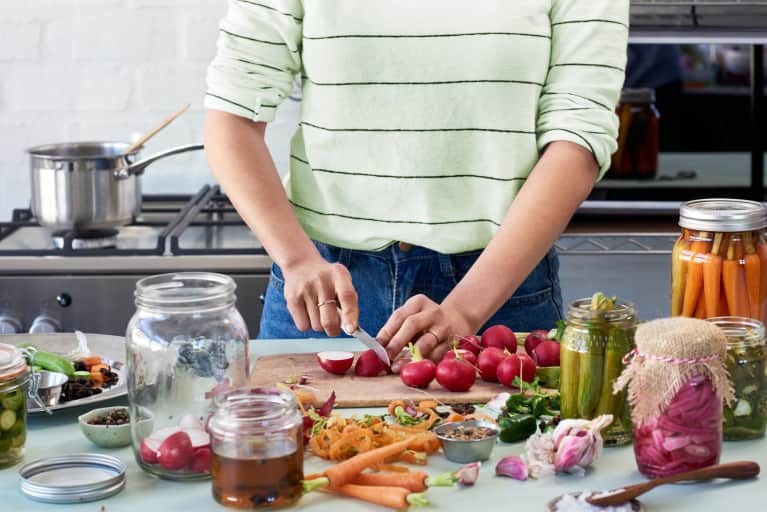 In this excerpt, Segedie—the founder of home detox company Mamavation—spells out how to clean up your food storage system at home, the plastics you should avoid at all costs in the kitchen, and what you should replace them with. 1. Look out for scratches and nicks. Step one is to inspect each piece for signs of wear, by which I mean etching, scratches, or nicks, or any cloudiness or discoloration. Subject the items you use most often to close scrutiny, especially any you’ve been putting through the dishwasher. Why? Because these are all signs that the plastic is degrading, and when plastic degrades, the chemicals are more likely to migrate out of the plastic and into your food/beverages. So any and all pieces that show signs of wear and tear are destined for the dustbin (or recycling can). Any plastic that’s gone in the microwave does not even get a glance: Trash it, girl. 2. Check on the code. Whatever you have left in the way of plastics should look pretty much brand-spankin’-new. Here’s what you’re going to do now: Flip each item over and look for the recycling code on the bottom. These numbers are optional; manufacturers are not required to use them, so you will probably find some that have no number at all (in my experience, go cups and black plastic items are almost always unmarked)—those flunk the flip test for sure. Chuck ’em. Here’s a quick-reference rundown on those teeny-tiny numbers on plastics. Bottled water comes in this plastic, which is designed for single use, so it’s not especially strong. As with all plastics, heat is a problem. When you leave a plastic bottle sitting in the sun or your hot car, you’re effectively helping all those chemicals leach into your water. Plus, bacteria can accumulate with repeated refills, so don’t reuse—recycle. Typically opaque with a lower risk of leaching, so many consider it safe. Best to avoid reusing; most curbside recycling programs will pick it up. Used to make detergent bottles and some food wraps. Never cook with or burn this plastic. May contain phthalates, which are linked to numerous health issues, and DEHA, which can be carcinogenic with long-term exposure. Most curbside recycling programs do not accept PVC. It’s found in squeezable bottles, frozen food and bread bags, and some food wraps. Curbside recycling programs typically do not accept it. Considered safer, but concern about endocrine-disrupting chemicals is mounting, particularly when it comes to use with fatty foods like cheese and ham. Used to make yogurt containers and bottles for ketchup and syrup, this plastic is becoming more accepted by curbside recycle programs. It’s safe to reuse if it’s in good condition and you avoid exposing it to heat. Used to make meat trays and those squeaky egg cartons. It’s bad for the environment because it is notoriously difficult to recycle, and it’s bad for us because it leaches potentially toxic chemicals (especially when heated). Most recycling programs won’t accept it. All of the plastics that don’t fit into the other categories are placed in the 7 category. It’s a mixed bag of plastics that includes polycarbonate, which contains the toxic bisphenol-A (BPA) and plant-based alternatives. The best and the worst are here. Use caution. 3. Keep #5 plastic and bid farewell to everything else. In the kitchen, I simply cannot in good conscience recommend that you use any plastic other than #5. And for the love of all things holy, never ever put any plastic in the microwave. Do not microwave food and beverages (including baby bottles) in plastic. Do not microwave or heat plastic wraps. Use alternatives such as glass and stainless-steel and ceramic. Buy phthalate-free toys or those approved by the European Union. 4. Opt for reusable glass or unlined stainless-steel containers. Whenever humanly possible, transfer all kid food to glass or unlined stainless-steel containers. There are plenty of cute, safe, washable, reusable ones available that you and your kids will love to display their lunch and snacks in. For other containers, carefully inspect them and toss them if they show any signs of wear and tear. 5. Keep the momentum going. Once you’ve started to knock out the first few things that lower your family’s exposure to the toxic crap hitchhiking its way into your body via your food, you’ll realize how much power you really have. There’s no shortage of other ways to make a difference. Do your best to avoid Styrofoam and shrink-wrap, since those Styrofoam trays (commonly known as butcher’s trays) are made from polystyrene, the main chemical component of which (styrene) is classified as a human carcinogen by the EPA. Linked to leukemia, lymphoma, and other cancers, polystyrene contains toxins that can leach into your food, especially when subjected to heat. As for the shrink-wrap? 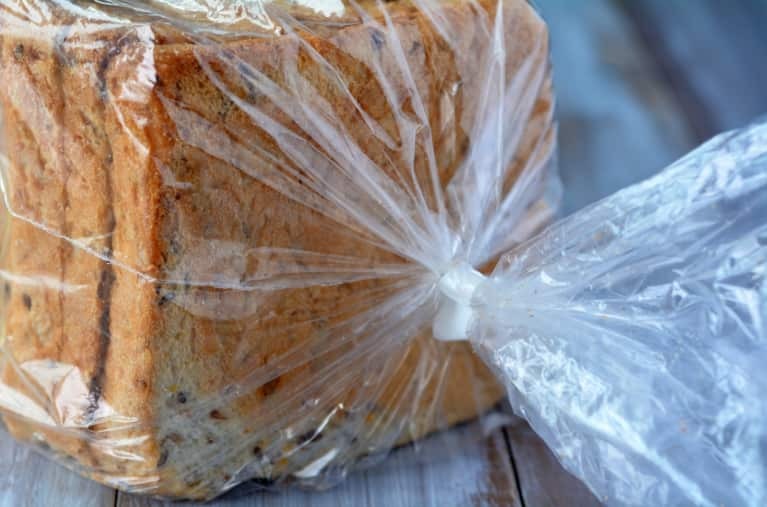 The products you probably use at home are safe-ish (it’s resin code #4; see page 80 of the book), but supermarkets need to rely on the heavy-duty commercial-grade shrink-wrap that is typically made from PVC (aka resin #3). That belongs at the top of your “hell no” list because it contains phthalates, kingpins in the endocrine-disruption realm. So as soon as you get home, peel off that plastic and, if feasible, wash whatever was wrapped in it.